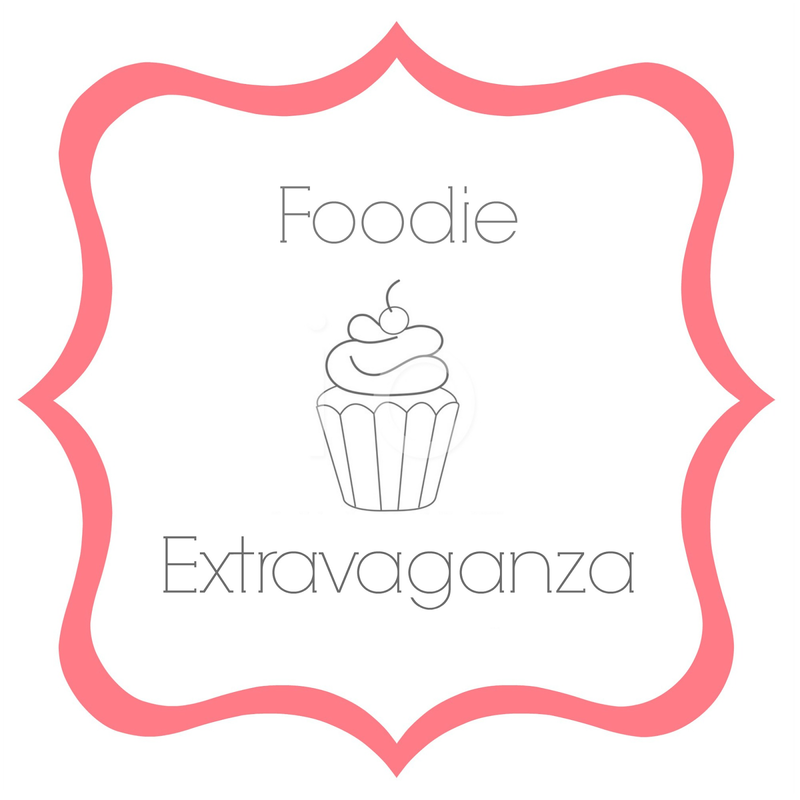 Welcome to the April edition of #FoodieExtravaganza where we celebrate food holidays, such as National Coffee Cake Day, which is officially April 7. You will have time to try this cake before taking it to work to celebrate! This cake has the delightful Jiffy cake mix as its base. I love Jiffy mixes because of the size and the simplicity of the preparation. This coffee cake is easy, too! I'd love to hear of your favorite Jiffy mixes and recipes! Prepare an 8 by 8 inch square cake pan with cooking spray. Preheat oven to 350. Prepare cake by stirring together the cake mix, oats, egg, applesauce and water. Beat until well mixed. Pour into prepared pan. To make the topping: melt butter in a small skillet. Add brown sugar, nuts and spices. Stir until brown sugar is melted. Pour over the cake top. Bake cake for 20-23 minutes, until golden brown. Cool slightly, then serve. These are all top notch bakers in the world of blogging! Go and check out their baking wonderfulness! Happy Coffee Cake eating! Yes please! I love starting my morning with a coffee cake like this, so I will definitely be trying your yummy recipe! Oh...I bet with the applesauce and the spices this one is a winner!! I could eat a piece right now! Yummy! 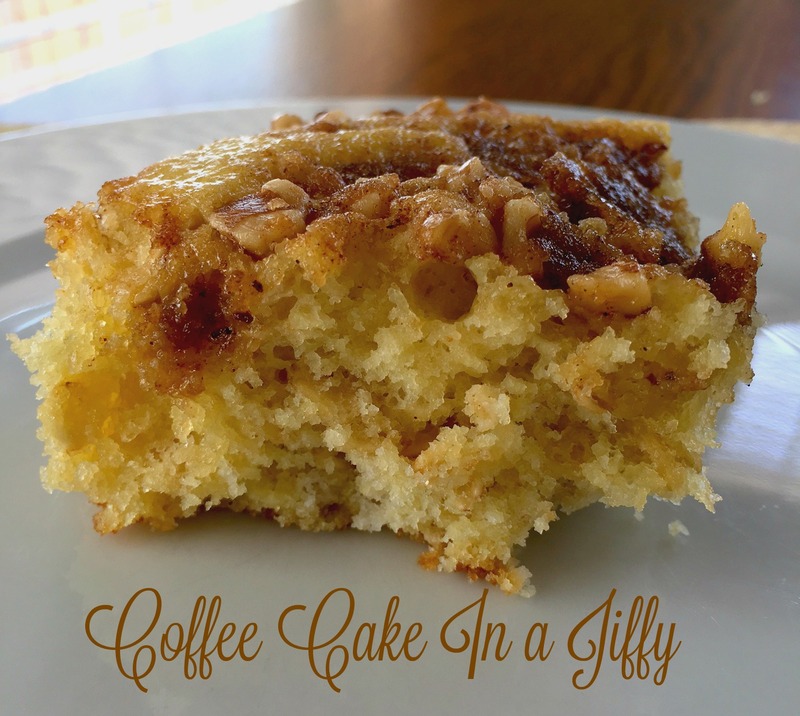 What a great and easy looking coffee cake! I love your selection of spices and the fact that you used applesauce. I love to bake but I have never made a coffee cake. Your recipe sounds simple and tasty! I haven't had a jiffy cake in years! But that coffee cake looks absolutely delicious. Is it lunchtime yet? And can I have cake for lunch? This recipe looks delish...and easy to make! I think I would make one even quicker by purchasing it at a grocery store! haha... That Swedish coffee cake link looks amazing! Yum! To make a coffee cake in just 31 minutes is what I call a pretty incredible feat don't you think? I love coffee cake but mine needs to be without caffeine. This sounds delicious! I would have to modify to make it gluten free, but it sounds so yummy! Honestly can say I have never made coffee cake, but I do enjoy eating it! This sounds amazing! I love coffee cake but I never think to make it. I am going to have to try this. I had not idea it was national coffee cake day. Your recipe looks delicious. I've been gluten free for almost 2 years and have yet to find a good gluten free coffee cake. This coffee cake sure looks delightful to feat on. I will be giving this one a try asap. I know I will be enjoying every bite. 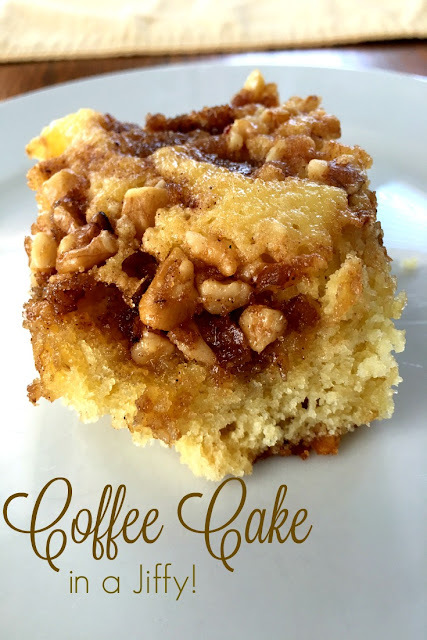 I never heard of the Coffee Cake Day! Love your recipe, it is so easy to follow. However this morning we celebrated pancake day, because this is what I cooked for the breakfast lol! It's amazing that the applesauce can replace butter for some things, but it won't replace the flavor. I like the texture but it is a bit more crumbly than with butter. We love coffee cakes here in our house but I've never really made it. I usually just buy them at Sam's or Costco. Now I'm going to make my own. I'm not really fan of coffee, but strangely enough I'm crazy about every dessert, cookies or cakes using coffee. Love this recipe, what could go wrong with coffee, and the spices? Mmm..yum! Yum! Great for a quick and delicious breakfast! Love that it's so quick to prepare! I haven't had coffee cake in a long time, but it's so good! Yum! this looks so good. I'm a huge fan of coffee cake but haven't had it in years. I think I'll try this quick recipe and share with coworkers! Of course I read this the night of National Coffee Cake Day. Looks like I need to make this tomorrow. I am so craving this now. We like to make coffee cake for Easter, and everyone loves it! This one looks very tasty. I LOVE coffee cake. I never make it, I'm not sure why! This looks like a delicious and easy way to do it, and I think I might make this for breakfast tomorrow! Coffee and cake, yum! I dont like coffee, but when you add cake, that just makes it better for some reason for me! This is so fun and what a great way to make this. I love coffee cake and of course with coffee. Omg how yummy is this?!?! So pinning so I can give this a try! I love coffee cakes, and this one looks really delish. I love that you added the walnuts on top! I just love coffee cake! I need to try this. Love how you doctored up a boxed cake mix... into coffee cake!! It LOOKS fantastic, too.